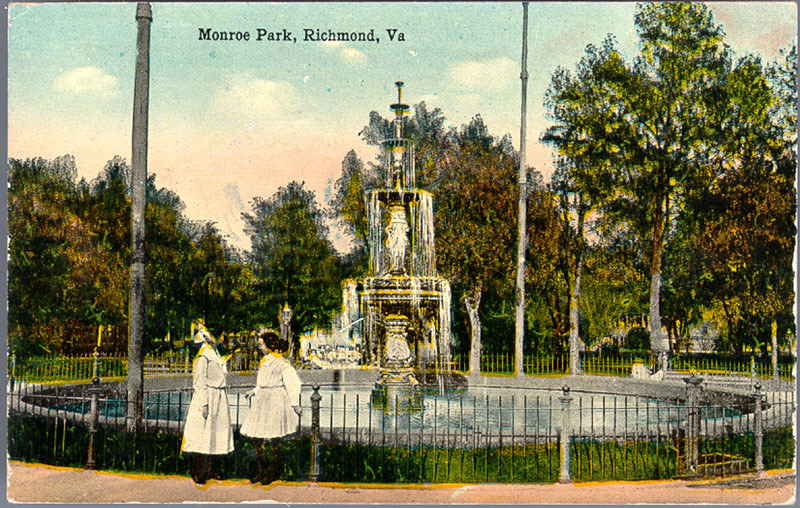 Monroe Park is one of Richmond’s oldest and most historically significant parks. Please click the link above for a detailed history excerpted from the Rhodeside & Harwell park master plan. The History was prepared by Tyler Potterfield. Scuffletown was a small settlement with a tavern once located near present-day Park Avenue and Strawberry Street. It developed in the late 1700s along the early road that carried coal from Henrico’s Deep Run pits. The tavern’s sign depicted a man’s head and shoulders emerging from an orb, and the cry “help a scuffler through.” The “scuffle” referred to a 1781 skirmish (near the current intersection of Mulberry and Grove) between the Virginia Militia and British soldiers led by Benedict Arnold. Park Avenue, originating at Monroe Park, follows the historic alignment of the Scuffletown Road and forms the characteristic wedge-shape of the “Fan,” creating a series of triangular blocks and small public parks. The Virginia State Agricultural Society was organized in 1850 to establish an annual agricultural fair. In 1853 it obtained the cooperation of the City in the development of Western Square as the home for the fair. The Western Square (Monroe Park) was an ideal site because it was large, open, relatively flat, accessible by railroads and turnpikes, and located just outside the city proper. The success of the Virginia fair prompted a national agricultural fair to be held on the fairgrounds in 1858. The fair relocated to a larger site at Hermitage Road and Broad Street after only five years. The cleared ground known as the Old Fairgrounds was used for military purposes during the Civil War. Historically, the land that would become Monroe Park was Belvidere, named by William Byrd III, who owned nearly all of Richmond in 1745. Byrd built his country house of the same name in 1758. The house and gardens stood until 1854, when destroyed by fire. In 1817, the Harvie family owned the land and created rural subdivision known as Belvidera. This neighborhood is now called Oregon Hill, located to the south of Monroe Park. Between 1816 and 1819, a period of real estate mania, created a frenzy of real estate subdivision and speculation around Richmond. The Harvie Family laid out a large subdivision, Sydney, and in doing so planned a majority of the squares (blocks) and streets in the present-day Fan neighborhood. The Sydney plan diverged from the layout of the earlier sections of Richmond, with the street axis running east and west. These subdivisions determined the locations of streets that would eventually shape the boundaries of Monroe Park. In 1923 the City built a signal station for police and fire alarms within the park at the intersection of Belvidere and Franklin streets. The impressive Classical-Revival-style building with a stone façade and large windows was contemporary with the elegant and utilitarian hydroelectric plant and pumping stations in Byrd Park. The City demolished the Signal Station in the 1970s when its corner location was in the path of the widening of Belvidere Street, a project that reduced the park acreage and changed its eastern edge from a straight line to the current curving alignment. Around 1890, the City constructed a wood frame building called the Keeper’s Lodge, which provided comfort stations for visitors to Monroe Square. It also housed the office and work space for the keeper responsible for maintenance and security of the square. Keeper’s Lodge was replaced with a new structure in 1939. The new park house came to be known as the “Checkers House” because of the regular games of checkers played there. The Park restoration in 2018 added an accessible plaza with low walls for additional seating. The first fountain, installed in 1871, was a rock pyramid with rolling water. The current fountain was installed in 1906. The presence of tieredtazzo fountains in Capitol Square in 1860 and the tiered Bartholdi Fountain at the Philadelphia Centennial Exhibition in 1876 is thought to have inspired the replacement of the original fountain with the more sophisticated design. This structure was given to Monroe Park by Dominion Energy, added in 2018, to provide cover for Park activities. In 1891, the Chesapeake and Ohio employees erected a monument to William Wickham in the square. The bronze statute by Richmond sculptor Edward Valentine depicts Wickham in his Confederate uniform. 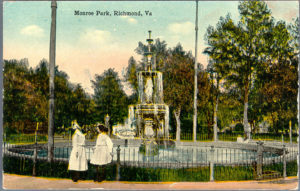 In 1951, noted landscape architect Charles Gillette designed the Richmond World War II Monument. The monument wall is inscribed with the names of Richmond’s fallen, with Inglenook seats placed in front of the monument. This Greek Cross, erected in 1911, memorializes General Fitzhugh Lee for his service in the Spanish American War. The statue of Joseph Bryan, a well known Richmond newspaper publisher, was erected in 1911 . The monument commemorates his service to the community. The plaque was given by the Daughters of the Society of the Cincinnati in 1932 in memory of George Washington. The bench was placed in recognition of a school that stood at the corner of Belvidere and Main Streets from 1866 – 1940.